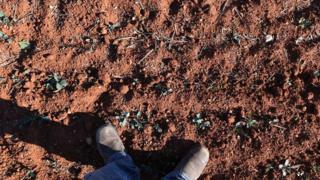 A drought has been declared in New South Wales, Australia, after an unusually dry winter there. The lack of rain has also affected other parts of eastern Australia, and farmers are struggling with crop failures and water shortages. Droughts aren't unusual in Australia, which is the driest continent in the world where people live. A drought happens when not enough rain falls over a long period of time and it leads to a shortage of water. Most of us think of droughts as a time when there's no rain at all. But actually they can happen when there's less rain than people thought there would be. Southern Australia has just experienced its second-driest autumn on record, with rainfall 57mm below the average. But so far, it's not the country's worst ever drought. That was the so-called millennium drought of 1997-2000 - it ravaged almost 50% of Australia's agricultural land. Why are droughts a problem? Droughts can have massive effects of farmers and their livestock. The drought in Australia has led to failing crops, severe water shortages and has meant that farmers have to buy expensive hay to feed their animals. The droughts have also led to bushfires, which are unusual at this time of year. Guide: What is drought and how does it happen?